If there's one time to brag about being a runner, it's at the doctor's office—especially when your appointment includes blood or urine analyses. 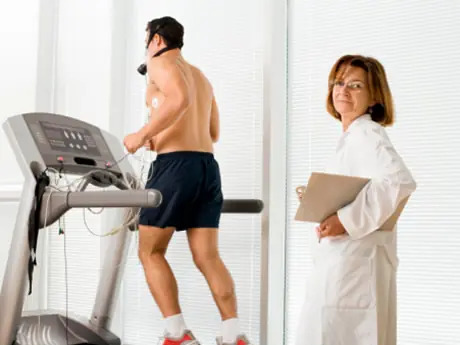 "Let your physician know if you're exercising heavily, and also how often and how recently you did tough workouts; it can influence how we interpret tests," says William Roberts, M.D., a family physician and medical director for the Twin Cities Marathon. If you recently ran hard—or even ran to your appointment, which Dr. Roberts's patients have been known to do—your doc might elect to reschedule some lab work. Here's a quick report of some running-influenced workups. Tells your doctor: Whether you've had a heart attack or other type of muscle breakdown; often done if you've experienced unexplained muscle pain or weakness or chest pain or tightness. Running's effects: Tough runs—especially ones that incorporate lots of downhills, which cause more microtears in your muscle fibers—can elevate these levels for a day or two, which isn't typically a cause for concern (here's how you can recover from a tough race). However, it may make it impossible for your doctor to tell if you've also sustained muscle damage from a heart problem or as a side effect of medications like statins. He or she may want to repeat the test at another time. Tells your doctor: How well your kidneys are functioning; often done when you experience fatigue or trouble sleeping. Should Runners Take Aspirin Before a Race? Tells your doctor: The levels of sodium, potassium and other electrolytes in your blood; sometimes done as part of a regular check-up or to monitor diabetes or heart conditions.